Tutoring Club of Wilmington will help your child on their way to success regardless of their skill level. 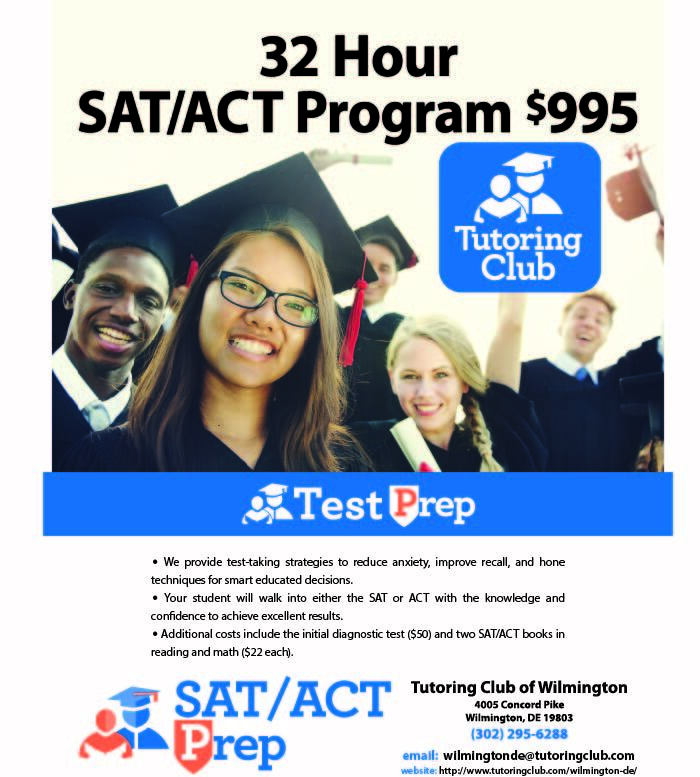 Whether your student needs help with the fundamentals, math, reading, writing, or even SAT & ACT Prep, our Wilmington tutors will get them pointed in the right direction with all the guidance that they need. Our individualized approach targets the student's weak points and improves them, bringing their ability up to the set goals. By covering key points at your student's own pace, we allow them to flourish and learn at a stimulating and rewarding rate. In Wilmington it can sometimes be difficult to find a good tutor that can help your student with their homework and prepare for tests in a constructive manner. At the Tutoring Club, we pride ourselves on choosing and thoroughly vetting only the best tutors in Wilmington. These tutors are experienced and knowledgeable in their skill areas and can provide vital assistance to your student whether the student is struggling with particular homework problems, needing a refresher before a test, or just wants to get more practice in before a final. If you have a student that is getting ready for college, we are no strangers to preparing soon-to-be freshmen with the knowledge that they need to succeed in the busy and challenging life of college with our College Prep Program. Wilmington Tutoring Club has skilled tutors, many of which have degrees or other experience in their areas. Serving Wilmington, Talleyville, Brandywine Hundred, Arden, Bear, Claymont, Hockessin, New Castle, and Newport Delaware. Also Aston Township, Bethel Township, Boothwyn, Chadds Ford Township, Garnet Valley, Glen Mills, Kennett Square, Linwood and Lower Chichester Pennsylvania. "My son is learning to be more positive about reading. He enjoys attending his tutoring time. I'd recommend Tutoring Club (of Wilmington)!" "Tutoring Club (of Wilmington) increased my son's confidence in transitioning to ninth grade; including tackling Algebra I. He also receives English and Biology tutoring. The Tutoring Club has made a large positive impact in my son's educational life!" Eric Levin was born and raised in Wilmington, DE. A lifelong resident of Wilmington, Eric graduated from Mount Pleasant High School, received a Bachelor of Arts from the University of Delaware in 1992 and a Master's of Science degree in European Studies from the London School of Economics in 1999. After several years of working in government, Eric returned to West Chester University to pursue a teaching degree. He is a licensed secondary education social studies teacher in Delaware and Pennsylvania. Eric taught high school and college from 2002 to 2012. As a social studies teacher and college instructor, Eric taught political science, international relations, American history, world cultures and geography. Eric is committed to the community of North Wilmington. He sees his business as an extension of serving students, parents and the larger community as a whole. As a Center Director, Eric oversees the daily financial operations of Tutoring Club. Besides working with students and parents, Eric is able to tutor AP American History, AP American Government and AP European History. In his free time, Eric enjoys spending time with his family (he is an uncle of 8 lovely nieces and nephews), following sports - especially the Philadelphia 76ers, everything politics and watching movies. Jennifer Tigani-Bridges was born and raised in Wilmington, Delaware. She is a graduate of Ursuline Academy; The University of Delaware, with degrees in Psychology and History; and Hofstra University's Paralegal Program. Stemming from a legal and political background, she has worked for the Judge Advocate General of the United States Army; Attorney General, Gubernatorial, and Presidental Campaigns. As the oldest of four children, working and mentoring children has always been a personal goal. As the oldest of four children, working with and mentoring children has always been a personal goal. In college, Jennifer was a writing tutor and mentor. Academic knowledge along with self-esteem, provides a solid foundation for success beyond the classroom. As a Center Director, Jennifer oversees the daily operations of Tutoring Club. Her main responsibilities include directing employees, managing parental conferences, and overseeing the daily administrative duties at Tutoring Club. Jennifer also communicates with the parochial and private schools. In her free time, Jennifer spends her time with friends and family - particularly her nieces and nephew. One free diagnostic test or session of tutoring! Some of our reviews from around the web!